The Invicta Dynamos are delighted to announce the return of 2014/15 Supporters’ Player of the Year Callum Fowler with the prolific forward returning to a side where he has already amassed a massive 463 points in just 193 appearances. After five seasons with the Mos, Callum Fowler made the much anticipated step up to the EPL in the summer as he penned a deal with the Bracknell Bees. 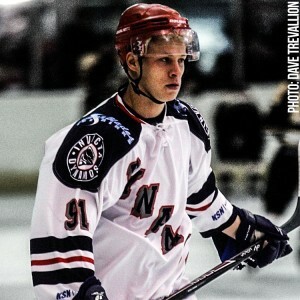 He left the Dynamos having been a major force in helping them lift the NIHL Southern Cup and having tallied a phenomenal 181 goals and 287 assists from 193 outings. Fowler was widely recognised as perhaps the league’s most talented player and in 2014 his peers voted him exactly that as skaters from across the division picked him as their Player of the Year. At the Mos he received similar recognition – the forward scooping both the Player of the Year and Supporters’ Player of the Year accolades at the end of season awards night. 2014/15 had been an excellent campaign for the 24 year old who finished the term with 45 goals and 84 assists for 129 points in 55 games. It was his excellent NIHL South Division 1 form that drew the attention of EPL clubs and Callum Fowler had earned his opportunity in the league above when he signed for the Bracknell Bees. However, after 13 appearances in the EPL in which he secured 16 points, Fowler’s new side suffered financial trouble and the forward has opted to make a return to his hometown club where he will don a Dynamos jersey once again. Speaking on the return of Callum Fowler, Head Coach Kevin Parrish said, “Obviously we’re delighted to be bringing Callum back. If we’re honest he’s an EPL standard player so to have him back in the NIHL where he has been so prolific over the last few years is fantastic for us. Any club in this league would take a player of Callum’s ability but he has strong ties to the Dynamos and I’ve no doubt the fans will be delighted to see him back in Gillingham. In recent weeks the effort of the team has definitely been there but we’ve perhaps been missing that spark or that bit of flair and there’s little doubt that Callum ticks those boxes. He’s a great player, he’s exciting to watch and there’s no question we’ll be a stronger team for having him back on the roster”. Callum Fowler will make an instant return for the Dynamos this weekend as they take on the Bracknell Hornets in Berkshire on Saturday before their final home game of the year against the London Raiders on Sunday. Tickets are already available from reception at the SilverBlades or can be purchased on the way into the venue on the day of the game.